Tipsters are rushing to get their phone leaks in before MWC 2012 kicks off, with the HTC Ville making its video debut ahead of the year's biggest phone show. As well as flaunting its size zero body (it's quite slim), the video made by HTC Hub shows off the HTC Ville's OS as Android Ice Cream Sandwich with Sense 4.0. Sadly, the video has since been set to private so we'll have to settle for photos. But rest assured, the animated transitions looked nice and zippy and, while the homescreens didn't look hugely different, most icon and widget design elements are a bit neater than previous iterations. Stylistically, the HTC Ville is very much in the vein of the Desire and Sensation ranges – aluminium unibody, curved elements to the screen and chassis and thick-set ports. Spec-wise, HTC Hub reckons we're looking at a 1.5GHz dual-core processor, 1GB RAM, 4.3-inch QHD screen, 8MP camera, VGA front-mounted camera and Bluetooth 4.0. However, as HTC Hub points out, this is only a prototype version of the handset so plenty could change when it takes the stage at MWC 2012 next month, including its name. 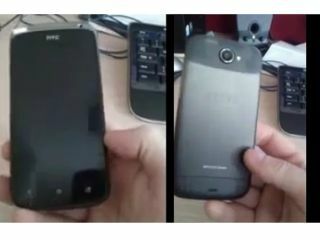 HTC is also expected to launch its first quad-core smartphone at the Barcelona trade show, in the form of the HTC Edge.